Most fitness business owners dread the holiday season that ends the year. Client consistency declines and new clients are holding out until the start of the New Year to make any changes. Back when I was running my studio there was a statistic that came out stating the average person gains 10 lbs between Thanksgiving and the New Year. To help our community combat this weight gain we ran a short 21 day challenge between Thanksgiving and Christmas. People are busy during this time of year and fitness is usually a second thought, but if you can make it easy for someone to maintain their weight or even lose a few pounds over the holidays with a small challenge you can bring in some extra revenue and get some great Front End Offer clients to convert to Core Offer clients in the New Year. During Black Friday or Cyber Monday you can sell holiday gift cards to your current clients to provide as gifts or to use themselves for upgrades. You can sell gift cards for a specific Front End Offer, pre-sell a New Year Challenge, offer discounts on gift cards or provide upgrade packages to generate some new sales. Many of your best clients are willing to invest a little more with you for a premium level program. Run a few specials to your best clients to offer them additional training, premium level services or paid in full packages that generate some extra revenue for you at the end of the year. Be careful here not to discount too heavily or to take a big hit on your monthly recurring revenue coming in from these clients. Find an organization to partner with during the holidays to give back to your community. You can volunteer your (and your client’s) time, donate money, or collect food/gifts/money for an organization. This is a great way to get some exposure but also to help those who need a little help. Each year in my studio we did food drive, charity bootcamps, adopted a family and a ran a toy drive during the holidays. Our clients were always happy to participate, we got some good exposure in the media and from the organizations we helped and collected a few leads along the way. You can sit around and complain about the holidays being slow or people not wanting to start their fitness programs during this time of year or you can take action. 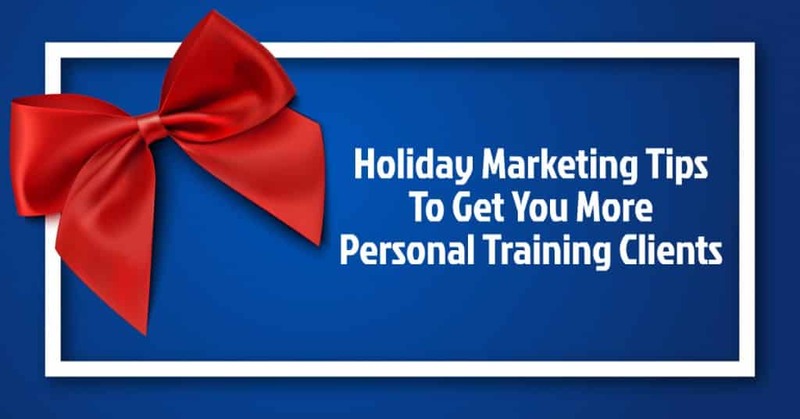 With the right plan and some focused marketing activities you can grow your business during this traditionally slow time of year for personal trainers. Pick one or two of the tips from above and include them in your marketing plan for the rest of the year.